Far from the X-ray machine, Mark Belles indulges in some signature craftmanship while welding a new creation in his garage-turned-workshop. As an X-ray technician at Bellingham’s PeaceHealth St. Joseph Medical Center, mountain bikers are some of his regular patients. But even if you haven’t met Mark—or been to St. Joe’s—you’ve likely seen his non-medical handiworks. They’re made of steel, and they hang above the entrances to nearly 50 of Galbraith Mountain’s trails. In reality, Mark began meeting riding buddies nearly three decades ago, when he started biking on Bellingham’s Galbraith trail system in 1989. But it wasn’t until 2013 that Mark’s first metallic masterpiece showed up on Galbraith, with the completion of Dog Patch, a winding cross-country trail built by his friend Devon Pelkie. To celebrate, Mark presented Devon with a hand-crafted marker for the entrance: a metal sign emblazoned with a paw print below the trail’s name. When Devon joked the end of the trail would need one too, Mark realized he’d gotten himself into something much larger than he’d planned. Next came signs for the Three Pigs climbing trails. From there, he began crafting unique pieces of art for trails all over the mountain, combining skills from high-school welding class with his three decades on Galbraith. Since Dog Patch, Mark estimates he’s made more than 50 signs. 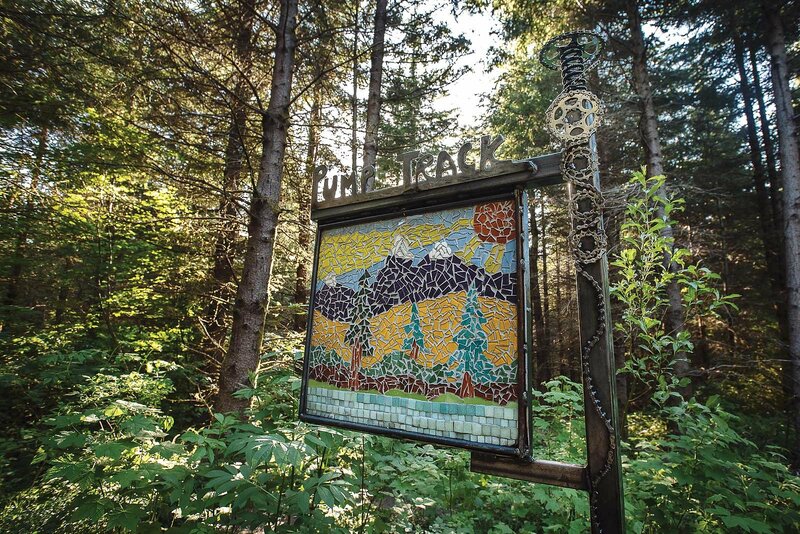 His painted, steel creations now dot the logging-road climbs, mounted on trees or decorative posts to mark most of the well-trafficked trails. Each is different, and often loosely depict a trail’s namesake. Some examples include a man’s head with a mullet and mustache; a giant, evil-looking wolf; and a monkey evolving into a bike-riding human. And those are the simpler ones. Mark’s signs mark the entrances to dozens of trails on Galbraith Mountain, and as he’s honed his style he’s schemed up larger projects, like this tile mosaic at the entrance to Pump Track. Drawing inspiration from everything around him, even tattoo artists and paintings, Mark begins each project by sketching ideas on paper. He then chalks his favorite onto a sheet of metal, and if he likes what he sees, it’s onto the plasma cutter. It’s a tool that lends itself to rough edges—so rough that some cuts border on looking like mistakes, which makes for an alluring contrast with the natural feel of the woods. “Sometimes it is the mistake that’s the cool part of the sign,” Mark says. Over the past five years, Mark’s projects have become increasingly elaborate. For his most recent, he cut out the trail’s name—Pump Track—from sheet metal, then, under the guidance of local tile artist Debbie Dickinson, created a mosaic of broken ceramic pieces to hang underneath. And he’s not limited to just signs. One of his most time-intensive projects to date was a bridge railing on Jack and the Beanstalk, a steel creation as functional as it is artistic. But perhaps what signifies Mark’s passion more than anything is how his signs have a way of magically appearing in the woods. There’s no announcement, no induction ceremony, and most definitely no social media post. One day they’re just suddenly there, guiding both friends and newcomers to the best riding on the mountain.